OPMS Gold Kratom Extract is made by using a state of the art method of extracting the main alkaloid, 7-hydroxymitragynine. This rigorous method preserves the integrity of the alkaloid and keeps the content true. 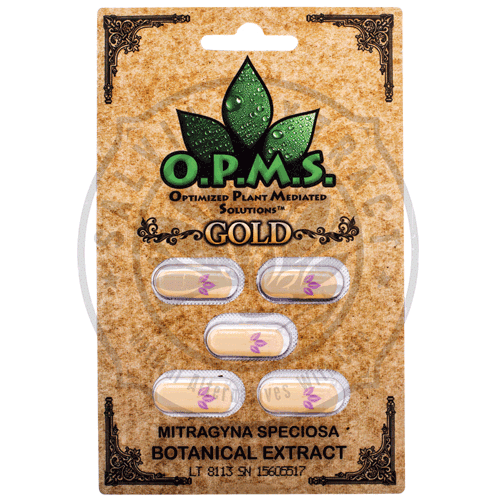 Organically Purified Mitragyna Speciosa, known more commonly as O.P.M.S. Kratom , is the leading brand of Kratom extract capsules. O.P.M.S. Gold Kratom Extract is revered as one of the strongest brands available due to their proprietary extraction method they implement to extract alkaloids. Most products employ a method involving hot water or a solvent. Under this process, the Kratom leaves are basically boiled out of the organic material and much of the alkaloid content is lost. Research specialists have recently discovered a more effective concentration method using cold water and high pressure. With this method, more of the alkaloids are preserved, making for a better and a more complete product. O.P.M.S. isolates and extracts the main alkaloid, 7-hydroxymitragynine, instead of doing a full spectrum extract. This process may explain why the potency of O.P.M.S. Gold Kratom Extract is so powerful compared to other products! Good product and fast shipping. I wish they would get back in stock! Trying to taper down. This plant is a miracle, with that said, I didn’t respect it thus I have nasty habit. So I want to taper down. Once I do, I will be free for a month, then start at 1/2 cap to 1 cap per day, no more than 2 times a week. My ask is if anyone here knows that if a taper method will be good, and if its necessary to do a 1/4 of a cap as taper. These people have crafted a beautiful product, a great alternative to the monsters concocting these vicious addictive pharmaceutical garbage that is our only other choice. Admin,can you tell me where to order wholesale?